Eye protection is important no matter what industry your company belongs to; a construction crew working to jackhammer a road would need vastly different eye protection than workers in a chemical production plant or scientists working to investigate blood-borne pathogens. Eye protection is important no matter what industry your company belongs to; a construction crew working to jackhammer a road would need vastly different eye protection than workers in a chemical production plant or scientists working to investigate bloodborne pathogens. So, taken all together, what are some possible eye protection measures you can put in place? Most of the time, your employees will need standard eyeglasses so they can see better. Although this might be sufficient in a typical office environment, under other circumstances this is still insufficient to protect them either from accidental injuries or direct harm to their face and eyes. However, you can equip them with safety eyeglasses that are specifically engineered to serve as eye protection. These glasses feature heavier frames made of sturdy materials such as metal and plastic and are shock-resistant, so if they fall on the facility floor, they won’t shatter. Goggles are also critical. Remember high school (or even middle school) when you first learned the importance of eye protection? Goggles should fit well and protect the eyes, face, and the nose. A variant of the standard design can help when working with extremely bright light, such as that generated by a laser. If you are working near chemicals, don’t forget to set up eyewash stations before you begin and stay close to them in case something should happen. Your employees can also benefit from wearing anti-laser goggles. Lasers can produce incredible amounts of light and heat, so you will want to be sure you keep enough of these items on had for whenever they are needed. Plastic face shields are clear enough to see through, but can still protect the face, neck, and in some cases, entire head, of your workers. 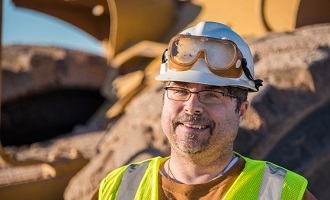 If you work in an area with intense sun glare or there is glare from bright lights, then you should invest in face shields that have been polarized, especially if you know some of your employees have a condition known as photophobia or an aversion to light. Besides protecting the face from light and heat, face shields can prevent stray sparks from hurting someone’s eyes. You’ll find that these modernized masks are often made of fiberglass or vulcanized rubber, so they shouldn’t be as heavy and exhausting to wear for long shifts. G&M Services is proud of our commitment to impeccable workplace and community safety. We reward our employees for positive safety practices. We incorporate weekly and monthly discussions and meeting to ensure that all involved are aware of how to handle equipment and potential situations that could occur during a project. This entry was posted on Thursday, April 12th, 2018	at 9:30 am	. Both comments and pings are currently closed.